“Working harder is stepping stone to success” is the only rule followed by this people, on 1st day of summer we say as Mayday. As it is on Monday and a long weekend, eTravelSMart is offering exhilarating upto 10% offer for everyone, enjoy everywhere and anywhere on booking bus ticket from eTravelSmart, also avail movie voucher from bookmyshow when you pay using jiomoney wallet. Travel more in smarter way by searching, booking and feeling of travelling through eTravelSmart on this enjoyable Mayday on Monday. ETS SPECIAL DISCOUNT, Get Upto Rs. 200 off + Rs 100 BookMyShow voucher on all bus bookings. How to avail the offer ? 2. Select bus of your choice and proceed to booking. 3. 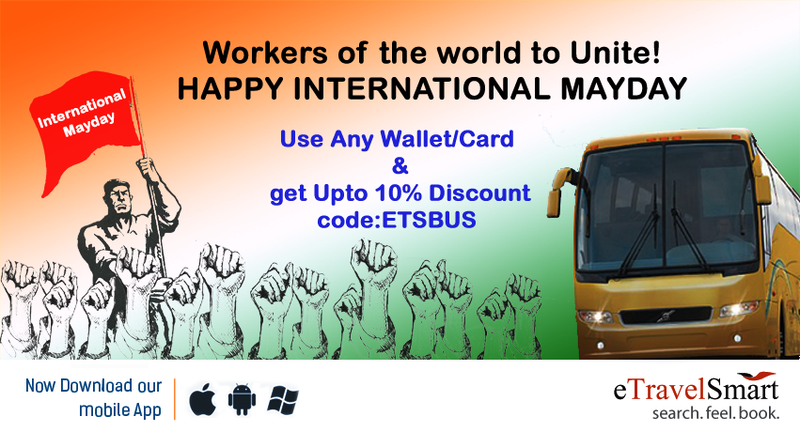 Enter coupon code: ETSBUS on checkout page to get upto 10% discount(up to Rs. 200). 5. Enjoy booking and happy travelling. eTravelSmart is a smart and intuitive online bus ticket booking portal, offering online bus ticket reservation services across India. 80,000+ famous bus routes and 3000+ bus operator are associated with us in serving people to reach their destinations with utmost comfort and safety. Our "Smart" technology helps passengers book bus tickets online among all famous destinations across India with just few simple clicks. Passengers are able to find a wide range of "Smart filters" which enable them choose "Bus operators, Type of Bus (A/C, Non A/C, and Volvo), Ticket Fares, Boarding Points, Dropping Points, etc". Special features like Block My Seat, Travel Insurance, Travel Recharge, Name on Seat, Seat Availability Calendar, Google Maps, Destination City Information, and many other unique features enable our customers to have a unified & redefined online bus booking experience. Our "Friendly" Customer Support team is always a step ahead in attending & resolving customer matters/issues with atmost speed & quality. Secure payment system with various payment options helps safe and secure payment transactions, while booking bus tickets. Transparent cancellation policy is added advantages for convenient bus tickets booking at eTravelSmart. Be a part of eTravelSmart family and enjoy an amazing Online Bus Booking experience.